How We Are Expertise To Show The PRO Publisher Blogs From BSA ? You will be wondered how did we pick this great news from BSA. However, we are not there even a normal publisher. Our blog (www.probloggertricks.com) has not been approved yet. So the question is arising how we have founded and listed down bunch of blogs who got PRO publisher authority in BSA which will surely prove the best for your adverting products . To tell you the truth. We are always landed once at BSA each single day and looking for new comer blogs to know how they are getting approval. Going this research daily we are now well aware with BSA work, mechanism and much more. So, we will let you know. If an advertiser demand for highest and PRO publisher blog to adverise his/her products. In such case. You will be probably go for selecting blogs only under the WHAT's Hot option category. Here is almost appear those blogs who got premium publisher. A blog may also appear under What's Hot list because of getting too much advertisers. As the name indicates itself what's hot. You will be seen this option when you visit the BSA website. It might be there for several times. Minded, what's hot option is given to all categories, and it will be visible when you click on the desire category. But you have to click on this option only in two major area's where it will give you the complete list of all the PRO publisher's blogs from the whole background of BSA all Blogs & website. So, where are the two major areas where you will be able to find this option. First time when you load the www.buysellads.com website it would be automatically show all the PRO publisher's blog. Who are usually super hit from there marketplace. You have successfully opened the BSA website. Now comes and then click on the Browse all Channel. Clicking on this option means you want to load all the existing blogs in BSA by a single page. So, when you click on Browse all channel option you will see another option near to "featured" option called What's Hot. Finally click on this option and it would show all the PRO Publishers from the whole background of BSA all approved blogs. It is more good option for those how are demanding high advertiser place for their products. If you are looking for some specific niche blogs for advertising. In such regards, BSA gives awesome opportunity for both publisher and advertiser. Since, BSA provides more than 10 categories along with different niches blogs or websites. It sound like that. A blog will be suitable more to place in Business and Finance category if its niche is all about Marketing & make money online nor to place in Web Design category. So, being acting as advertiser you should follow the related niche blog for your banner that related to your products. Go for web design category, if the product is more about designing and development. 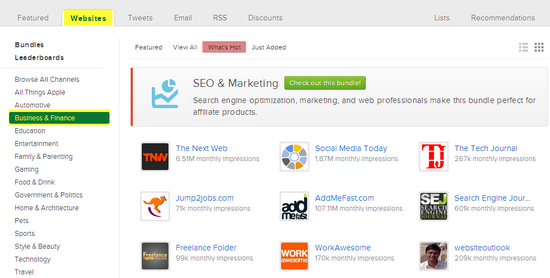 Go & try to choose blogs under the technology category if the product is about tech tools. Noted: here we have given the example of business and finance category if an advertiser looking for PRO Publisher under the Specific niche category blogs. So, in the same way you can choose another category >> first click the desire the category and then click on the what's hot option. This will give the list of all the PRO publisher blogs. We hope this tutorial have helped you in learning how to put your wealthy banners on the Top BuySellAds Publishers Blogs. 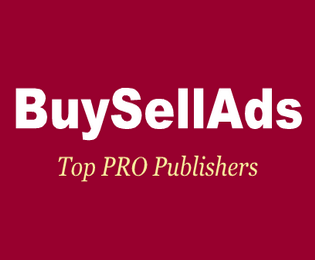 The tutorial also lead you to know how to find ultimate publisher blogs for advertising from BuySellAds marketplace. If anyone need further assistance then kindly do post your query in the polite manner in the below comment section. You will get reply within 24 fours. Thanks and happy BSA day.